Jodi Kostelnik designed this cheeky dish towel, inspired by sharing good times with friends over a bottle. You know how the song goes. But whether or not you're with the one you love, wine is always good company. 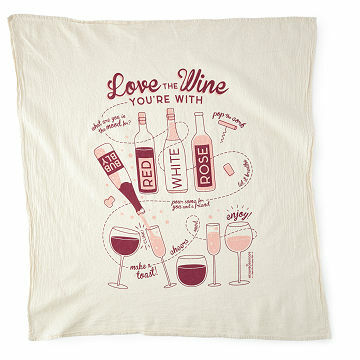 Jodi Kostelnik designed this cheeky dish towel, inspired by sharing good times with friends over a bottle. Give one to the host who's always there with a generous pour—you can even use it instead of a paper wine gift bag. How's that for a little green with your red? Designed and packaged in DC. Printed on 100% cotton in Wisconsin.